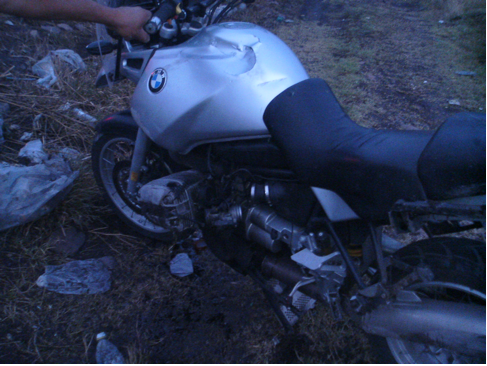 Well, Not The Motorcycle Diaries has had a bit of a hiccup en route from Guadalajara to Puebla (I’m a bit behind on keeping the blog up to date in real time). We’ve been trying to cut down on costs so we’ve avoided the autopiste (the nice, safe, private toll roads of Mexico) and stuck to the libre roads which are notoriously more clogged and dangerous. Queue music. Dum. Dum. Dum. Leaving Enlaces Mexico (aka our friend Jody's business) in Guadalajara. En route to Puebla after the second time in two hours Josh's bike broke down. The hailstorm was so intensely loud on the tin roof we could shout and still not hear eachother. 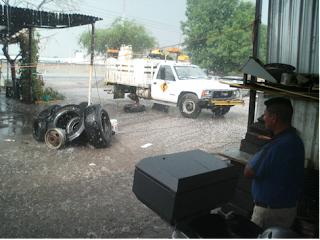 We’d just experienced an intense hailstorm which we had to get off of the road in order to shelter from. It went on for about half an hour as we waited it out in a mechanics shop and then we got back on the road for a while and hit some traffic. 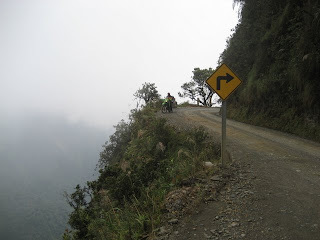 We were thinking about turning back for the autopiste but instead we rode the shoulder for quite some time. +Josh Rowan was riding ahead of me about a mile. 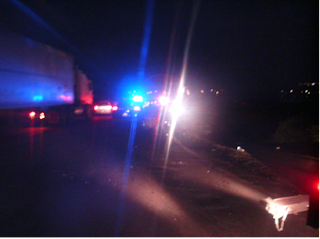 The traffic was jammed as far as the horizon with tractor-trailers turning off their engines to wait out what we later came to know was actually quite usual. I was going about 25mph when a red 1990 Jetta pulled out of nowhere perpendicularly in front of me. Apparently a truck had made room for this car to get through and make a turn after having been traveling in the opposite direction of me. I applied the brakes and tried to swerve right in order to avoid him but he was traveling at too fast of a rate and I was hit by the front drivers side of the car. This sent first me through my windshield and then the bike airborne for about 25 feet. 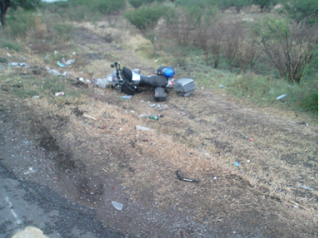 The bike and I separated from eachother and all I could think was, ‘This isn’t normal,’ as I flew through the air looking down at the ground as things I recognized spiraled away from me and then landed five feet from the motorcycle. 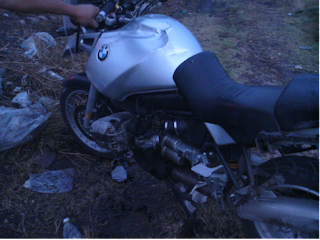 What's left of the motorcycle after the crash. 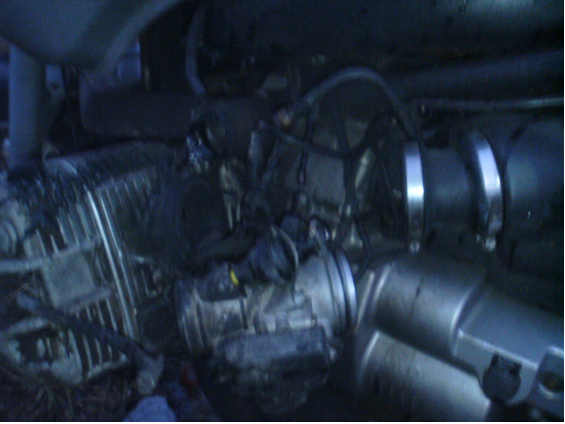 What's left of the 1990 Jetta that hit me. The black streak is from my left handlebar. Probably my favorite photo from the trip so far... Always Smiling! Where I went through the windshield. Notice the dent in the gas tank. That's where my knee went into the tank before I took flight. The realization and the pain start to set in. I instantly got up and looked around at all my things and pieces of the bike strewn across the little ravine we had landed in. Then I noticed that the motorcycle was on fire after the dizzy lights in my vision dissipated and started yelling to the people whom had already gathered around for water. ‘Agua, agua!’ everyone began to yell as the flames got bigger and bigger. One of the guys that was in the red car started walking towards the bike with a liter of water and I stopped him long enough to warn him about the dangers of an explosion. 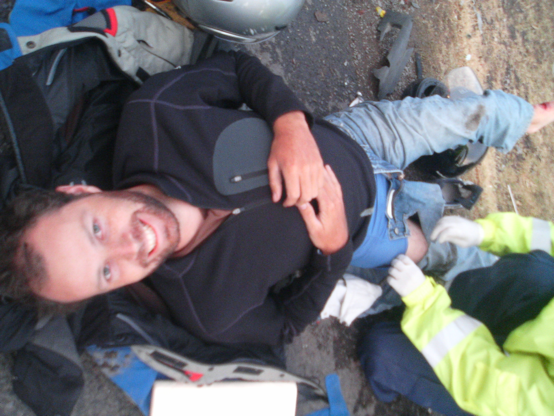 A woman then came up and told me to lie down and relax and that she was a nurse. Joshua was still a mile away and I could see that he had stopped and was waiting for me so I began to yell his name somewhat frantically since I knew at some point he’d probably end up being my EMT. I was lying down by the time he finally skidded to a stop five feet from me. I had just noticed that blood was seeping through my left sock and so I tried to reach down and take my shoe off when I noticed a pretty sharp pain up near my right shoulder. 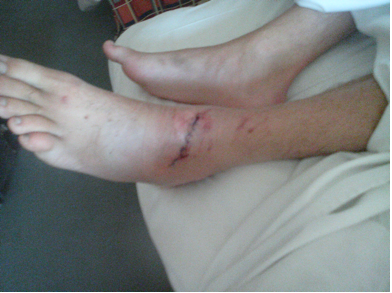 I still managed to get my shoe off and then the nurse that happened on the scene took off the sock for me. The top of my foot was pretty much split open. 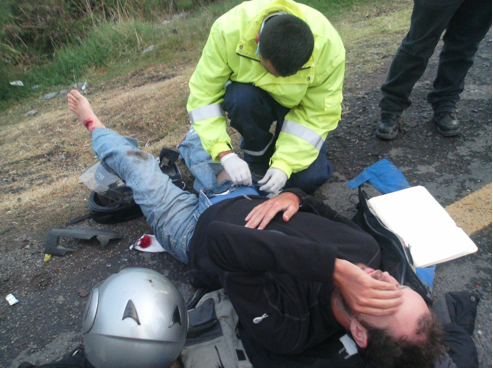 I sat still as Josh checked me for a concussion and vital signs as well as any other damage (a pretty deep bruise on my right thigh where my pen had skid along with me until it exploded) before checking on the motorcycle which had luckily been put out. The ambulance finally arrived thirty minutes later. 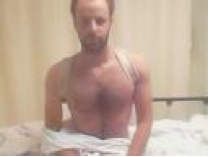 They cut me out of my clothes as they bandaged my foot wound and put me in a neck brace and restraints in order to transport me to the hospital. 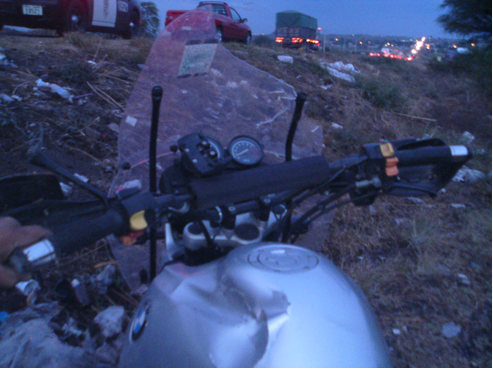 The paramedics said it would take another twenty minutes before we made it to the hospital and offered me a drip for the pain which I declined (don’t really want a needle stuck in my arm in a moving vehicle on Mexican roads). But now my foot is really starting to hurt and the ambulance is going at a very slow rate due to the fact that my situation isn’t grave. As I stared at the lights on the ceiling of the ambulance it reminded me of the only other time I’ve been in an accident and funnily enough it pretty much happened the same way: I was fifteen and riding my friend David Smith on the handlebars of my BMX on the way to soccer practice when we were waved across a four lane highway by a motorist. 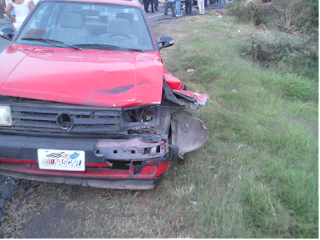 But it happens that I can’t see beyond the car that has stopped and I start to cross the road and lo and behold we get hit by a car. I went flying for about thirty feet doing a couple of flips and land on my head while my friend David scratches a little bit of his elbow. I refused to allow the doctor to give me stitches since I’d never had any and wanted to keep it that way. 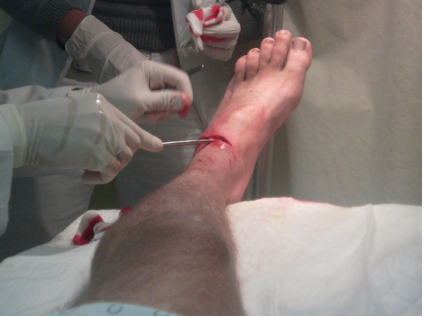 This time I was the one asking for stitches to be done sooner rather than later. We arrived at Los Angeles Hospital and I was wheeled out and introduced to the doctors and given an assessment by the paramedics. They cut off the rest of my clothes (except the red star Che shirt which I respectively and painfully asked them to take off of me without cutting me) and decided that some x-rays needed to be taken. As the young attractive Doctora was taking down my information it came to whether I was married or single and I answered, Why? with raised eyebrow. Always a good line. She somewhat gruffly answered, ‘Because we need your information.’ Then I explained that it was a broma or joke and she thought that was pretty funny from a guy with a broken clavicle and wide open foot. She and another doctor wheeled me through some gently slopping corridors which brought me back to another dream I’d had before embarking on this trip which was strikingly similar (slowly being wheeled through a sterile hallway and only being able to look at the ceiling and unable to move) in which I am forgotten in a hospital after having x-rays taken. So I start to get a little worried once I’m wheeled into the x-ray room and everyone leaves the room. Luckily the technician kept coming back to adjust the machine to take more x-rays but after twenty minutes of x-rays I started to get a little anxious about the large open wound on my foot and asked my doctor if she knew that I had a large gash on my foot since it was all covered in gauze and a cast. She looked somewhat startled and disappeared for a bit and then asked the x-ray technician to finish up. They finished stitching me up and went away for a while leaving me alone to ponder what the hell I’m going to do now that I’m maimed and my motorcycle is destroyed. Well, the trip must go on since this is just the first country we’ve made it to. I need at least three weeks of recuperation. The motorcycle is totaled and it would cost more than I paid for it to fix it and that would take upwards of two months to fix so that’s not an option. I could hitch-hike and take buses for a while but somehow I don’t think I could afford that either. I guess I’ll just have to focus on getting better for now because I don’t like where this slippery slope is going. I know, I know, I do look good in scrubs. The head doctor, Dr. Vargas, came back in and explained my predicament: from the x-rays I have a 25% fracture of my right clavicle that will take about three weeks to heal with an upper body brace and I’ve received twelve stitches in my left foot which will need to be taken out in ten days while in the meantime I wear what looks to be a snowboarding boot to protect it. And now for the fun part, payday! Josh has returned and is helping me pay and figure out how to get to the hotel that he has sequestered our things in when my Doctora offers to give me a ride in her car since she’s getting off soon anyway. We head to the hotel that Doctora Daniela, lo mejor doctorcita en Mexico, as she insists we call her, has never heard of in her town of Queretaro. She and the security guard help me up to the room as Josh heads to the pharmacy for some meds (not any fun ones just an anti-inflammatory, a muscle relaxant, and an antibiotic). Daniela tucks me in and leaves her phone number so that we’re not totally lost in some city we think we’ve never been in before and says goodnight. I dose off as is my want usually when things go wrong or right. Josh wakes me up with pills and food and I gladly partake. We watch a bit of television and turn off our brains for a bit since they’ve been fried by a day of officials and the gravity of hospital situations. The television then scrambles into indecipherables. The next day I wake up and Dr. Daniela Juarez Moran is standing in the doorway as Josh mills about the room. 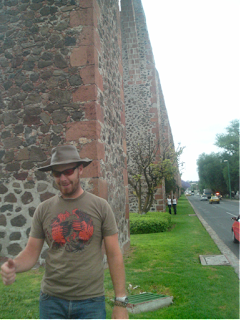 He’d called her after she’d offered to show us the old town of Queretero. They hustled me out of bed and I hobbled through the lobby and folded myself into the passenger side of her car not knowing quite what to expect (normally the day after something like what had happened to me I stay in the fetal position in bed for twenty-four hours). As we approach the downtown a series of connected arches come into view and we start to drive parallel to them; turns out its an ancient aqueduct that Daniela tells us a monk built to deliver fresh water to the nun he was in love with. We scoff in a sort of disbelief but then Josh remembers having had our picture taken in front of similar arches many years ago. We get out of the car and walk around the cobblestone streets (a bit difficult with my big slippery boot thing) and sit at the puppy fountain for a while before looking for a bite to eat. Josh orders chamarra which turns out to be the calf muscle of pigs/cows depending on the place. This place being luckily the latter. Turned out to be quite delicious and we all ate a bit of his before heading back to meet up with Daniela’s sister Tania at a bar that they frequent by the name of Rumi’s. Pretty happy to be alive and pretty happy about my doctor. 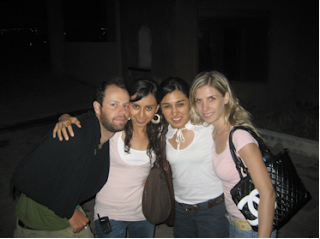 Me, My Doctor, Her Sister, and La Guerra aka The Blond. Joshua holding himself back from climbing los arcos, the aquaduct. 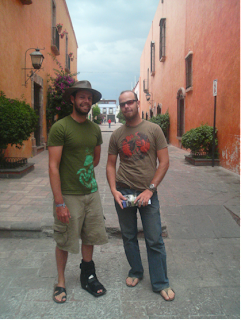 Joshua and I enjoying the sights of old town Queretaro. This is perfect since it just so happens that these girls love Bacardi Rum and are on their way to becoming rummy’s. Diana, another sister of theirs, is waiting for us along with an assortment of friends including a cousin and her fiancé and the ever present La Guera or The Blond (real name Brigitte and apparently being known as The Blond in Mexico doesn’t have the same connotations as in America). Daniela also comes from a family of four siblings which almost mimics our family of four brother’s ages. We take the party back to the one and only hotel we’ve stayed in for some drinks and a game called Castigo which literally means punishment and involves dominos and booze and punishment. I believe Josh had to do 70 push ups and I did dance along to Ricky Martin for a bit and La Guera did some sort of leg contortionist thing but I don’t think it was part of the game. La Guera striking a pose. We wind up the night and Tania and Daniela invite us to stay at their house since we can’t afford to stay in the $100 a night hotel so the next day I once again am woken by Daniela and Josh milling about the room packing up my stuff (please notice the trope). We moved in the next day and had quite an eventful week which I’ll post next and which won’t be too long in the making (please give me one or two days, my clavicle kinda hurts.) That’s right I played the clavicle card. So, in closing of this momentous post I'd just like to thank everyone that has supported us on this trip so far and as you can see the adventure will continue - albeit I'm not entirely sure how right now but I have faith in the fact that things always turn out right. They have so far. 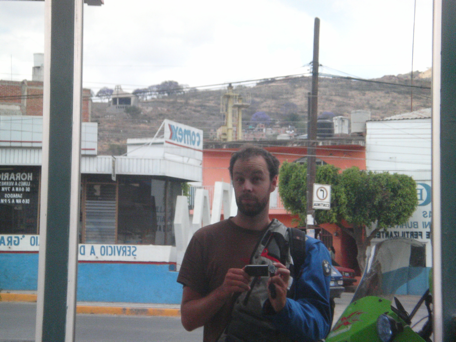 So we set off from La Paz, Josh having reassured me that he had an excellent sense of direction - we immediately headed to 'Zona Sur,' which was entirely the opposite direction to where we needed to be going to exit the city - luckily Josh isn't shy of asking directions and we promptly headed up to the north of the city and left through 'El Alto.' The first day started well, good roads, excellent views of the mountains and no more getting lost, it wasn't too cold and the bike at that point was reasonably comfortable. This all deteriorated as the day progressed - everything bar the views which were great the whole ride through. So we stopped for lunch at Oruro and changed the oil (documented by film) and investigated the possibility of taking the train down to the south. We arrived at the train station where i proceeded to fall off the bike landing flat on my back, this was both painful and and embarrassing, i think i masked this well by laughing insanely for at least five minutes. Josh laughed heartily and didn't help me up, shock horror! We opted for the road as the train was going to a bit more expensive (and they say that the British are tight with money?!) 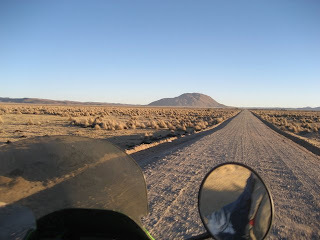 The roads from here on were pure crap - deep sand, uneven, unmarked and at times almost in-passable! Despite all this we had great views and managed to get some good pics, eating dirt all the way. We arrived at a small village in the dark - we weren't sure where we were, for my part i didn't care i just needed to get off the back and sleep. The place was okay - kind of clean with toilets and hot food, actually a relative oasis in comparison to the thought of camping out in the open for the night. My body had ceased to move in a natural way at this point - my hips felt as if they may never recover - as if i had been riding a horse for the last 6 hours! Josh looked equally as beat, dirty and every year of his age!! The following morning started reasonably early at 7 ish. 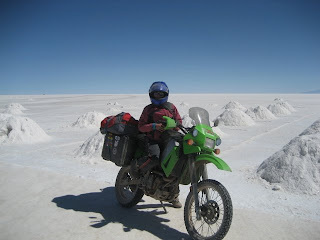 We set off with a full flask of mate de coca and headed towards the Salt Flats on yet another fantastically crap dirt road! This didn't last too long and we soon cruised onto the relative smoothness of the Salt Flats , which Josh insisted on referring to as ice. Just how cold this stretch of the trip was i cannot describe in words, i did almost want to cry (but i didn't for fear that the tears would freeze!!) 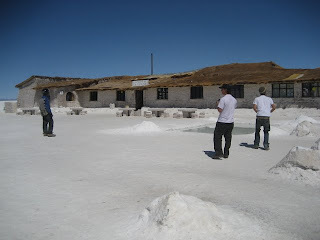 So this wide expanse of retina burning salt was being harvested for sale, used to build hotels on the flats and drawing tourists from all corners of the globe. It was quite a sight - as far as the landscape was flat there was salt covering the ground, ceasing to exist only where the mountains rose up out of nowhere to interrupt the serene whiteness. 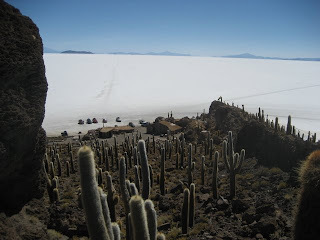 We encountered an island in the middle of this wide expanse, it's main inhabitants cacti, tourists and restaurants. It was an amazing and most welcome sight to me at this point - very randomly and ingeniously placed. We stopped here for some time and had lunch - well i made an attempt at eating - i had lost my appetite as the journey had started and it had not yet recovered - excellent diet plan i think! 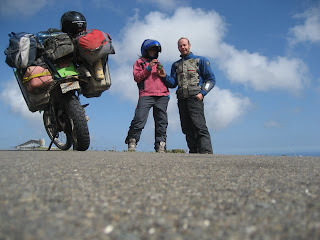 So after meeting and chatting with random people and some Italians (if i recall correctly) about the joys of motorcycle trips (i left the majority of this chatting to Josh - he's far more qualified for this kind of conversation than I am) we set off again for the Chilean border. Whilst we had taken the break i decided to apply my scarf to my neck and sore throat, since that day my scarf has only left my neck for the purposes of cleaning my body - I have most definitely appreciated and bonded with my scarf within the last week - i will never disrespect or take my scarf for granted again. So we found the road/track for the border at which point Lechuga decided to give us little a scare and just stop. I think this may have been due to the fact that Joshua had plugged all of his electrically heated clothing into the battery and zapped all of Lechuga's precious energy!! I found the fact that his clothing could do this to the bike and that she had stopped in the middle of nowhere a touch alarming and so laid on the floor for a while. After recharging our batteries and being passed by some selfish arse tourists in a jeep (who didn't stop) we pushed Lechuga down the track engaging all our remaining muscles (which for my part was about 6 i think!) 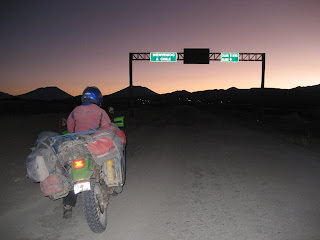 We finally reached the border crossing just as the sun was going down. 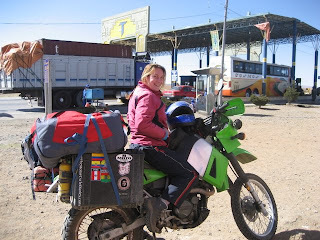 It was in the middle of nowhere and there was very little going on - as soon as the formalities had been done we found accommodation and settled down for the night. The next morning was much better and as soon as we set off I was feeling considerably better having regained the use of my body overnight. 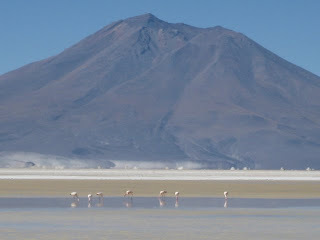 We passed through some mountains and skirted another salt lake after which we encountered a beautiful lake of pink and turquoise blues inhabited by pink flamingos and against a backdrop of smooth mountain peaks and bright blue skies. This could well have been the highlight for me so far, the scene was tranquil, peaceful and infused with the soft colours of nature - untouched by human hands as far as I could see. We continued on the track which steadily got worse and deteriorated into deep sand which at one point almost put us in a heap on the road side. It was of course my sheer strength that kept us upright - Josh may have helped a little :0! We reached the city of Calama by 2pm and stopped for lunch, an oil change and I almost adopted a small white dog (all he needed was a bit of love and a good bath.) 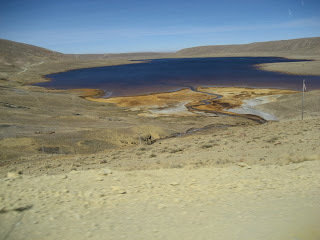 But common sense overcame me and we left for the Chilean coast on good roads but with much side wind. We reached Antofogasta in the dark just after 7pm, this was going to be one of the trends of the trip for us - we would without fail arrive into every destination in relative darkness. Antofogasta was nice as far as first impressions went and the sea front was cute with many palm trees - we foolishly attempted to get a room in the Raddisson which was clearly out of our budget even if they had have admitted two dusty scruffy waifs like us into their very flash hotel. We found a place to stay which was nearer the centre and it had hot water in no short supply which was heaven. So the next morning started with a nice breakfast and then a ride along the sea front to take lots of photos. 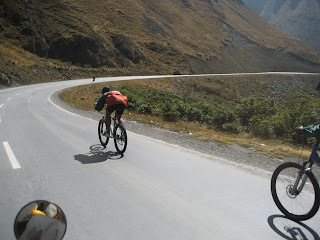 We set off on an inland road in the direction of Santiago - it was both windy and cold and we went very fast it seemed. We stopped for a quick lunch at a small sea side town and then continued again. This day of biking was largely boring - most of it was through a desert but when we reached the coast it was a nice change to see the waves of the South Pacific breaking against the jagged rocks of the Chilean coast. We stopped for the night in a small town inland of the coast and stayed in hostel on the town square. Emailing took first priority followed by pizza and half a bottle of wine for Josh, which had a terrible affect on his personality. He suggested that we order a dessert and then proceeded to steal every piece I had on my fork, I was amazed by his gentlemanly and mature manners. This man never ceases to surprise me. This was followed by him playing hide and seek in the square on our way back to the hostel. I know that the goal for Chile was no hospitals but it seems that I very quickly failed at keeping my promise of avoiding doctors. 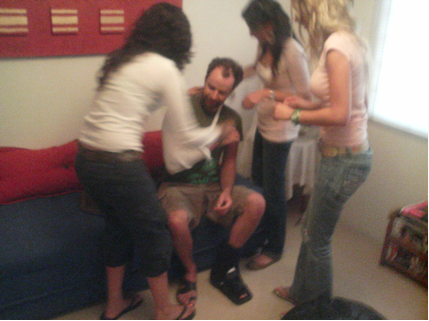 Seems that since Costa Rica I’d developed what I thought was quite a benign rash – something along the lines of eczema – which turned out to be something quite different (or not since to this day it still hasn’t been definitively diagnosed). It could have come from swimming in a ‘seemingly’ pristine pool created by a waterfall in Costa Rica or just the drinking water. Or it could be the remnants or a parallel bug from my bout with Dengue Fever but whatever it was it wasn’t going away anytime soon. While Tara was in the hospital in San Jose, CR I had one of the doctor’s look at it since it seemed to be spreading and he diagnosed it as a yeast infection and gave me a cream (one of many ‘creams’ that are promised to do the trick). 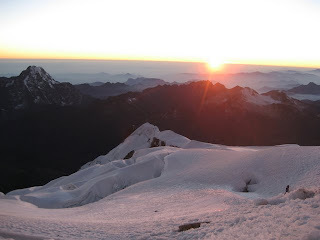 It seems to abate and Tara was recovering from her surgery and had decided she wanted to go home forthwith so I continued on to Santiago, Chile in order to meet up with Joshua for the last leg of the trip into Ushuaia. 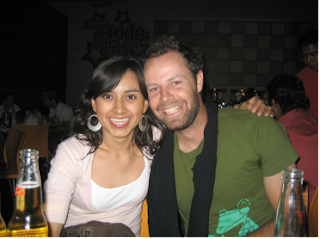 It seems that Josh neglected to specify which Monday he’d be pulling through Santiago and so I waited a week for him. 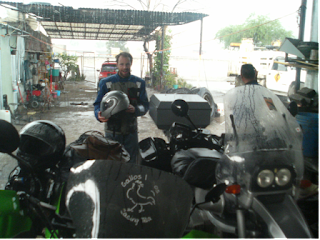 Finally he pulled in which a Brit on the back of the bike and they relayed their woeful stories of the freezing cold rain and road in some sort of Scared Straight program against me getting on the motorcycle with Josh to head into even colder climes. While I waited for them I made sure to take advantage of Santiago (a gorgeous city), Valparaiso (how come port cities always paint their homes garishly different tropical colors? ), and the Concha Y Toro vineyard and estate (well, one of them since they own something like 250 sub-brands including Casillero del Diablo and Don Melchor which recently received 94 points from Wine Spectator) and I also took it upon myself to go to a Dermatologist in the hopes of actually identifying the jungle rot and prescribing something for it. Valparaiso, Chile and it’s Colorful Hilltop Homes. I took a walk over to the Universidad Catolica de Chile hospital and went looking for someone possibly versed in tropical infectious diseases since this is what I was convinced it was by this point (it’s not getting any better from the ‘cream.’) Nope. But I saw a dermatologist by the name of Dr. Marco Pereira Moya who immediately knew what it was. It was a bacterial infection and he had me throw the cream I had been using in the garbage right then. ‘Siete dias con eso y se quito.’ Seven days with this cream and it’s gone. Great. I can rest easy. Bobbycakes and I in Valparaiso. Fine Chillean Wine Drunk Rowan Style. 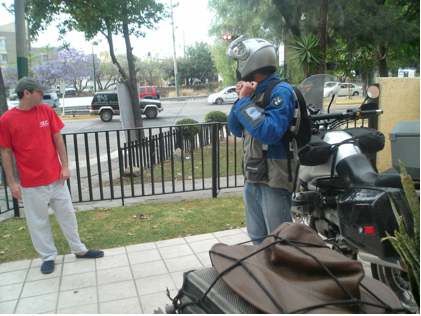 Waiting at Andes Hostel in Santiago for Joshua. 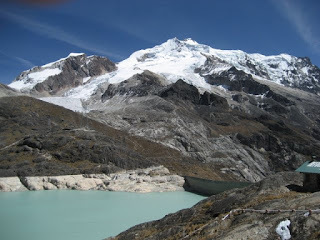 Josh and Vicki spend the weekend recuperating from their trek (café con piernas helped) before Vicki heads back to Peru and thereafter those fabled isles of empire while Joshua and I stay to began the task of repacking the bike with all our worldly belongings. 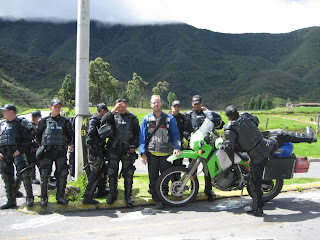 The Chillean Motorcycle Carabineri let me take their Bike for Ride. Come Monday morning we’re ready to set out even though the infection/rash has become exponentially worse, so much so that it has become very difficult to walk. But with the four layers of clothing needed to actually stay warm whilst riding the bike I decide to brave it. 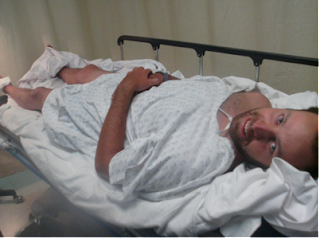 I have sworn off hospitals for the remainder of the trip while Josh swears off booze and women since he has a problem (kidding, he swears off motorcycle mechanics shops since he’s averaged more than two per country). And we’re off. Well, kindof. Seems that we need a certain type of oil first so we go to three different lube places before getting the right kind. Then we’re off. Our goal is to make it down to the Isla de Chiloé. Of course we only make it less than halfway (three hours of Josh driving and two with me at the handlebars) before Joshua notices that the bike is acting up (engine is cutting out while we’re riding as if it’s out of gas but it isn’t) which has in turn but undue pressure on the chain and sprocket which sends us directly to a Taller Mechanico de Motocicletas. The chain was so dangerously worn that he needed not only a brand new chain but also new front a rear sprockets in a country that doesn’t really have a Kawasaki presence thus a minimum of a two day wait. Off to a hotel with all of our bags. And since this infection has gotten worse I take it upon myself the next morning to see another doctor. At this point I can’t even walk; I resemble a ninety year old man slowly and painfully walking up and down the streets of Chillán searching for the elusive dermatologist due to a plethora of faulty directions (you get used to it). Dr. Miguel Torres Ramirez takes a look at was has become a very disgusting wound of a rash and is pretty much freaked out – but also certain that it’s possibly a bacteria infection and puts me on an antibiotic and has a lab due a culture of the sample but the results will take 48 hours. I wait for two days of pain in the hotel room bleeding continuously with no sign of it getting any better and then revisit with the doctor who now has the results; negative for a bacterial infection. But Dr. Torres doesn’t take no for an answer and decides to do another culture. This means another 48 hours of no idea of what this is and absolutely no alleviation but rather deterioration of the infection. I decide to seek a second opinion; Dr. Raul de Mendoza Vera is a less of a quack but is similarly stymied. 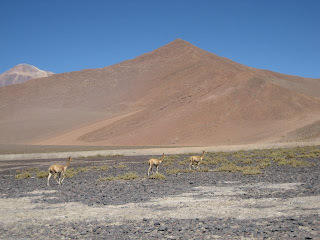 He opines that it looks to him more like some sort of tropical disease and that practically no one in Chile is going to be able to diagnose it and certainly not in the small town of Chillán and he suggests I hoof it back to Santiago to the Universidad Católica Hospital. And so the next day away I go (oh, Josh has already left two days previously since he’s on a bit of a schedule and needs to make it thousands of kilometers to Tierra del Fuego in a little over a week) gingerly walking to the bus station and going back to where I started. Share My Hurt and My Pain. Of course at the Universidad Católica the next day they say, ‘Nope, we don’t have any specialists like that.’ What to do? Book a flight to Panama that night at take off the next day to seek out someone who perhaps knows what this tropical infection is, perhaps someone who actually lives in the tropics. Dr. Alfredo Cantón Martínez (Infections Specialist) of the Hospital Nacional takes a look and is at a loss; he has never seen anything quite like it, doesn’t know what it is, and suggests hospitalization as well as the same culture I’ve had done twice now as well as a biopsy. I think that since this infections specialist in the tropical country of Panama doesn’t know what it is than the chances of it being diagnosed here are just as slim. Let’s go back to Key West since I’m already halfway home and let Dr. Whiteside, a tropical infectious disease specialist, take a crack at it. And if I need hospitalization I’d rather be at home (and I’d rather have insurance but that’s another point). Whiteside and his internist prescribing something. So with the dueling doctors of Whiteside and Covington in Key West chugging along on the diagnosis train I’ve been on a barrage of anti-biotics, anti-fungals, anti-viruses, and anti-parasitics over the past few days sans hospitalization and, although there has been no certain diagnosis, seem to be healing finally (let’s just say that it got pretty gross there for a while). So, as I lay in my sickbed Joshua has finally finished the trip that we started together (and that I wanted to finish with him) at Tierra del Fuego where today he went swimming in Antarctic waters just to finalize things. He made it 30,000 kilometers without a flat, which he was gleefully celebrating, when 300 kilometers before Ushuaia he had a spoke go through his tire and left him stranded in freezing cold Patagonia for half a day and night. Tierra del Fuego the au natural Rowan way. But the journey is not over. Glen Heggsted of Striking Viking fame gave us some words of wisdom in Mazatlán, ‘Only pussies go one way, you have to go down and come back up to make it legit.’ So it looks like once I recover I’ll head down to Ushuaia and pick up the remnants of the bike (post flat tire, oil-guzzling, and rear tire needing) to start up the eastern coast of South America. Hell, I might even rig a raft around the bike and run a propeller for the ride up the Amazon!